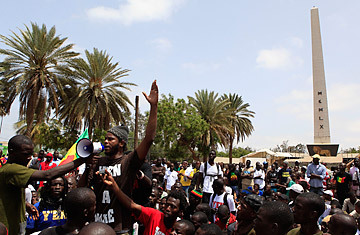 Senegalese rapper Thiat, a leader of the 'Y en a marre' (Enough is Enough) opposition group, addresses protestors during an opposition rally demanding that Senegalese leader Abdoulaye Wade renounce his bid for a third presidential term, at Place de l'Obelisque in Dakar, Senegal, July 23, 2011. Senegalese rap star Omar Toure  stage name Thiat  was arrested two weeks ago after after publicly denouncing his country's 85-year-old president, Abdoulaye Wade, as a "liar" who was too old to govern. But the authorities released Toure just 30 hours later, under pressure from the thousands of young people who had taken to the streets of Dakar to protest his detention. Long regarded as one of Africa's more democratic leaders, Wade in February set off a storm of protest that has not yet abated by declaring his intention to seek reelection to a third term and pressing for a constitutional amendment to allow it  Senegal's constitution currently restricts him to two terms, but his supporters say he's simply trying to avoid the divisiveness that an election without him could bring. In response, Toure and other rappers, together with journalist Fadel Barro started the Y'en a Marre ("Enough Is Enough") movement to prevent Wade from running again. "The movement is growing," says Malal Talla, stage name Fou Malade, a rapper who is another of the movement's leaders. "We ask the people to act, to take the initiative. It's about Wade, and whether or not he's gonna stay." The new movement has also been inspired by the events of the Arab Spring to the north. "People thought about what was happening in the Arab countries and they voiced their opinions very loudly," says Ousmane Sene, director of the West African Research Center in Dakar. And by making themselves heard, the rappers seem to have rattled Wade's government. "People don't think that this kind of thing happens in Senegal. It's one of the two or three most politically-advanced countries in the whole of Africa," says Paul Melly, associate fellow for Africa at Chatham House. "What [the protests] tell you is that a very strong-willed older gentleman seems absolutely determined of the belief that he should be Senegal's president, and he is risking his country's Constitutional stability... He's become increasingly autocratic... and he's gradually concentrated more and more political power into his own hands." Senegal's growing unrest is troubling for those among its neighbors that look to it as a model constitutional democracy. "[Senegal] plays a very significant role in that it's regarded as the leader, the bellwether," says George Ayittey, a Ghanaian economist. "And it's been one of the most stable countries in Francophone West Africa. Everyone in the region looks up to Senegal, so if something happens there it will have a ripple effect." Though the movement's focus remains on Wade, economic frustrations have creeped into Enough is Enough's agenda. The list of grievances now includes rising food and fuel prices, along with widespread electricity cuts that can last for up to 20 hours and have long been a source of frustration. "The lack of economic opportunity has always been plain, and Senengal has seen an exodus of youth," says Ayittey. "There's a lot of restlessness. There's resentment and unease bubbling, it's only needed a spark. And the trigger I see is [Wade's] bullheaded attempts to push through this amendment that would allow him to remain in power." Wade has begun trying to make concessions in the face of rising anger. After June's riots, he withdrew the parliamentary bill that would have allowed him to win a third term on the basis of just 25 percent of the popular vote, as opposed to the more than 50 percent required by the current constitution. Sene calls it a "serious setback" for the incumbent. But Enough is Enough's most significant victory may have been to convince the authorities to push the voter registration deadline back two weeks, to August 15. A U.S.-European Union audit revealed that as of the end of 2010, only 12 percent of Senegalese between ages 18 and 22 had voting cards, and the rappers have shifted their focus to registering young voters. They're clearly having some effect: lines at registration stations around Dakar have been long. And the rappers have released a campaign song, in which they sing: "My voting card is my weapon / It will be the solution to my suffering." If next February's vote brings a new term for Wade, there could be more trouble on the way. "The implication for the region would be very worrying if he somehow strong-arms his way to re-election, for example by rigging the votes," Melly says. "Senegal has always been seen as a model for the other countries to follow. It would send out a very worrying signal to the rest of West Africa." Some fear that Wade may take advantage of this month's Muslim holy month of Ramadan to push through his reforms, a move Ayittey warns would cause the situation to "blow up." But his opponents in the Enough is Enough movement are steadily spreading their message, although literally through word of mouth. Unlike Arab activists, they can't put too much stock in social media  internet access is limited in Senegal, and anyway, says Ayittey, "to secure access, you need reliable electricity." See why Western-educated Africans are moving back to their homelands.